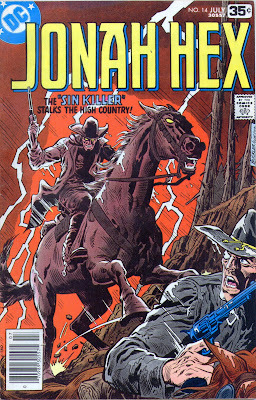 Matching Dragoons: Jonah Hex #14 "The Sin Killer!" 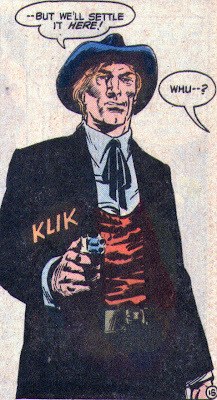 Jonah Hex #14 "The Sin Killer!" Jonah is standing in a saloon, minding his own business when all 5 Stolper Brothers (Yancy, Rafe, & three others) come sauntering in. They walk up behind Jonah and start talking about how they are going to buy everyone drinks because they will be rich once they bring Jonah in for the $10,000 bounty. Jonah retaliates by breaking a whiskey bottle across the Rafe's mouth. Rafe falls to the floor and Jonah guns down two of the brothers. He then kicks over a pot-belly stove onto a fourth brother and then guns down the last Stopler brother. Jonah runs out of the saloon, jumps on his horse and rides off. The Stopler brother that had the stove kicked at him comes stumbling out of the saloon, swearing that he will kill Jonah. We hear a voice from the shadows state "No, Sinner! Vengeance is the province of the Lord! And as his servant its execution is mine.." and the man in the shadows pumps three bullets into the Stopler brother. Three days later in Ringwood, Oklahoma, Jonah is getting the barrels sawed off his shotgun by a local blacksmith. The blacksmith invites Jonah to a prayer meeting that a circuit preacher is holding. Jonah is about to turn him down when he mentions the big picnic supper. Jonah decides that he can use some free eats. At the prayer meeting, the preacher is talking about the evils of the world, the coming Armageddon, about the Lord helping those that help themselves, the lion & lamb and the lion being tamed. Jonah is munching down on a chicken leg when he realizes that he knows the preacher. After the sermon, Jonah heads to meet the preacher. The preacher, Jedediah Kane, was known by Jonah six years ago and Jonah thought Jed was dead in El Paso. Jed invites Jonah into his wagon to talk over old times. Jed explains that after that gunfight in El Paso he almost died and for three days teetered on the brink of death. Afterwards he decided to change his ways. He took up the cloth, married a woman and started a family. A few years later he took his congregation down to Knobb's Creek for a baptism service. However, a group of cattle rustlers had set up camp there and a bunch of bounty hunters were stalking them. As the congregation arrived at the river, the bounty hunters opened fire and the entire church was slaughtered. It was at that point Jedediah began his crusade to smite the Philistines. 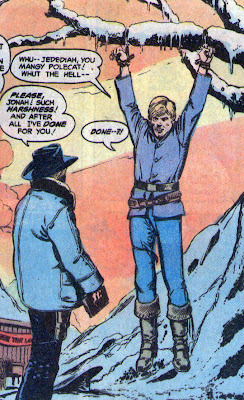 Jonah asks what Jed means by that and Jed explains that it means he kills bounty hunters, and suddenly pistol whips Jonah. Jed then packs up his wagon and leaves, taking Jonah with him. The caption explains that "For hours, the creaking wagon winds its way over rocky paths, climbing high into the nearby, snow-capped mountains." Uhhhhh, there are no snow-capped in Oklahoma. The highest point is Black Mesa and it is in no way a mountain. But, back to the story. Jedediah has taken Jonah to the snow covered mountain peaks in Oklahoma Territory and left him hanging by his wrists from a tree. Jed rails on about this being a method of salvation for Jonah and that this way Jonah can repent of his greedy sinful ways and be saved. Jonah sees it as he will be left to starve. Jed gets into his wagon and rides off. Jonah figures that the tree branch he is hanging from is so loaded with snow & ice that he might be able to break the limb. He starts swinging and then brings his weight down on the branch, thus causing it to snap. Now he is on the ground and tied to a large branch. He's not able to untie the rawhide with his teeth so Jonah carries the branch to a frozen creek, smashes the ice and soaks the rawhide in the freezing water until it stretches enough for him to get it untied. Then, with his arms soaking wet and no proper clothing, Jonah starts making his way down the mountain in the building snowstorm. He manages to knife a rabbit and eat it raw. Hours later he stumbles up to a mountain cabin where a trapper is able to save him. After several days, Jonah borrows the trappers horse and rides off. Days later in Ralston, Kansas, Jonah is asking around about Jedediah. Folks acknowledge that there was a traveling preacher just that morning but he left town about an hour ago with a sandy headed fella with missing teeth. 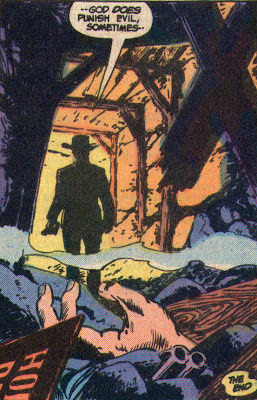 Later at an abandoned silver mine outside of town, Rafe Stopler is holding Jedediah at gunpoint and is about to kill him. Jed tries to reason with him but Jonah sneaks into the mine behind Rafe. Rafe turns and Jonah plants his pigsticker knife right in the middle of Rafe's chest. As Rafe goes down, he squeezes both triggers, hitting a roofing beam in the mine. Jonah reaches down and picks up the shotgun, telling Jedediah that they have several things to settle up between the two of them. Jed reaches into his Bible and pulls out a derringer that is hidden there is several cutout pages. Jonah tells Jed that the shotgun has weakened the roof and they need to get out of there. Jed accuses Jonah of lying and Jonah tells him that he is using religion as an excuse to carry out his own vendetta. Jedediah shouts that God punishes evil and Jed opens fire. The noise causes the roof to collapse and in the end Jonah is able to crawl out from the rubble. Standing up Jonah says "Jedeiah, ah guess ah owe yuh an apology. It seems yuh wuz raht about one thing, after all...God does punish evil, sometimes." And Jonah walks out of the mine, leaving the dead body of Jedediah behind in the mine. Timeline - This story takes place over probably about 2 weeks ("three days", "several days", "several days") and is part of the Jonah fugitive story line. Jonah still has the shotgun he picked up in Louisiana two issues ago. I liked the cover of this issue with the red sky, lightning, and glowing eyes looking like a throwback to the early Weird Western days. The story? Ummm, not so much. I have never cared for the crazed preacher angle unless the writer has actually shown a good grasp of the scriptures and is able to convince me that the crazy preacher actually believes that God is telling him to kill people. It just seems like a lazy way to write to me. This turns out to be a mediocre story. And by the wat, does Jed look like Robert Mitchum in Night of the Hunter? Next Issue: Rings of fire, knife throwing, and the freak show comes to town!!! Mountains in Oklahoma? Ok, maybe they set it in the same place that Smallville seems to be filmed. I never knew that Kansas had such nice mountains and primieval forests! Wait, maybe Jed took Jonah up to Colorado? Seems like an awful lot of effort, but hey, he's supposed to be crazy!